Version 2.7 is now available. Following a recent comment elsewhere about the Contractor I got to thinking how crazy it would be to design a Taxi version. The Retila Shipyard Co-operative (RSC) is a shady organisation consisting of various Mafia, Triad and Pirate groups, who were brought together by the legendary super-criminal Kran Hoftus to build and market the notorious 'Contractor' uber-ship. Although the ship is not illegal, GalCop is well aware of the Shipyard's dubious ownership and is known to monitor the situation closely. As time passed RSC realised that they would benefit from having a 'legitimate' business arm to maintain an air of respectability and of course for money-laundering and other nefarious purposes. However, no one in their wildest dreams would have expected them to start manufacturing Taxis, but that is exactly what happened. The RollyJoger TaxiWorks was established to manufacture the Contract-a-Cab after the RSC (somehow!) won the contract to build a fleet of luxury Limo-Taxis for the prestigious YellOo Cab Company. Also surprising was their decision to use an adapted version of the Contractor spaceframe as the basis for their Taxis, but this actually made a lot of sense, as the ship was the right size and shape, all the development work had already been done, and it turned out to be both very adaptable, and ideal for cost-effective mass-production. However of necessity the specifications are very different. Gone is the expensive organic hull plating in favour of steel. The three Muon-Schism drives have been replaced by a single Quark-Oscillation engine giving a top speed of 3.6 LM. The Contract-a-Cab has three Energy Banks with a 'medium' re-charge rate of 3. Two missile slots are fitted. The Contract-a-Cab comes as standard with the basic equipment needed to perform its role, with standard Escape Capsule, Fuel Injection, Fuel Scoops, Heat Shielding, forward Beam Laser (and a rear mount), and of course a special luxury Passenger Berth which also incorporates a passenger Escape Capsule. All other equipment options are available. However the Contract-a-Cab has NO hold or cargo extension available. The Passenger Berth is an integrated aspect of the design and cannot be removed to release cargo space. Due to a quirk of GalCop law this means that the Contract-a-Cab has a nominal hold capacity of -5TC listed in its specifications. For anyone looking to operate a YellOo Cab Co franchise, the Contract-a-Cab will excel at providing a safe, comfortable, reasonably fast and reliable means of plying your trade. Full details and downloads can be found on Smivsonline and the Wiki. This was released yesterday, but due to those hacker b******s I could only formally announce the release now. Top marks to the Five of you who have already found and downloaded it. Last edited by Smivs on Tue May 15, 2018 4:09 pm, edited 14 times in total. The AI is really just a pared-down version of route1TraderAI. I removed all the targeting/attacking bits and made it 'Flee' at the first hint of trouble...it will keep running until it's off the scanners. It seems to work OK. I may download and "acquire" it then... Nice one. surely a taxi should be running the "flyLikeATw@CosTheRulesOfTheSpacelanesDontApplyToMe.AI? Killer Wolf wrote: surely a taxi should be running the "flyLikeATw@CosTheRulesOfTheSpacelanesDontApplyToMe.AI? Yep, completely concur. Needs a special AI involving sudden braking and acceleration, changing direction without any warning, and shouting abuse at everyone. Yeah, looks like I missed a trick there As the whole idea of what amounts to a 'Constrictor Taxi' is so crazy, perhaps I thought this would be balanced out by having 'sensible' cabbies who just want to deliver their passengers and pick up their fare. Having been a radio controller for a cab company, I can tell you that cabbies are an ‘interesting’ bunch of people, often erudite, and with an opinion on absolutely everything. They certainly know how to throw a car around town. Just out of interest: are you aware of the two older cousins of this OXP? Commander McLane wrote: Just out of interest: are you aware of the two older cousins of this OXP? Yes, thanks, but I think healthy competition is a good thing. Plus Planetfall Taxi of course, along parallel lines but with the player doing the runs. Last edited by Thargoid on Sat Jan 08, 2011 12:19 pm, edited 1 time in total. 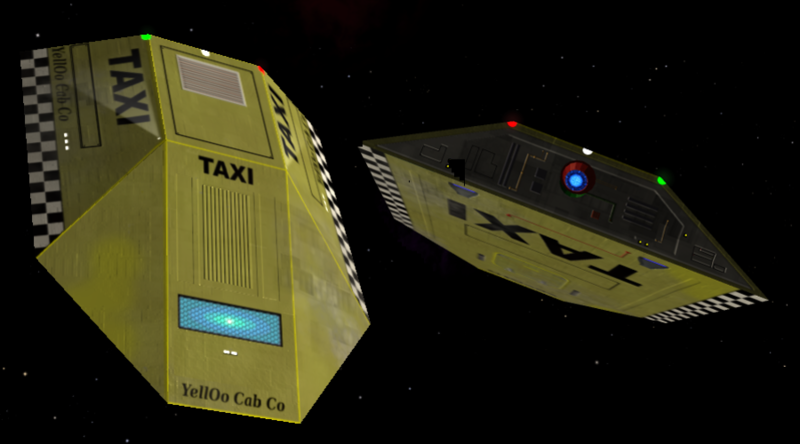 The YellOo Cab comes as standard with heat-shielding, so can land using planetfall, as far as I know. Some NPCs also act in the 'Shuttle' role, so they may be seen going between planet and station. I have just uploaded v2.0 of this OXP. The original OXP exploited a 'feature' in earlier versions of Oolite. However in Oolite v1.76 the feature was deemed a bug and was fixed, and this in turn broke the OXP! In effect, it removed the passenger berth. I have now scripted a fix for this, and v2.0 is compatible with Oolite v1.74 upwards including v1.76.